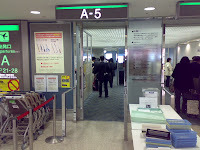 She was delayed in LAX which made her miss her flight to Okinawa. 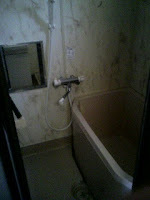 No problem though, they put her up in a Japanese Hotel. It was a little delay but she was able to soak in the Tokyo lights. "Thank you Lord for bringing Melissa to us here in Okinawa, may she grow in the Grace and Knowledge of our Lord Jesus Christ. Amen"
God blessed us with so much wood left over from the remodeling the Sanctuary, we decided to make benches for the upstairs park/study/relaxing area. 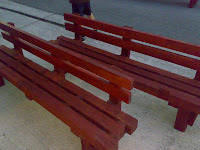 We will have a fire pit, tables, chairs, umbrellas, plants and now park benches. We are looking forward to some good times, upstairs on the third level. 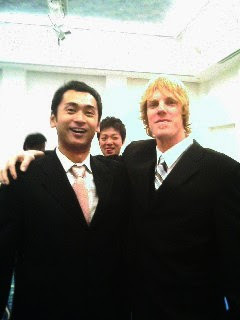 Josh Dean is now in Tsuba but the Lord brought us a new Dean; Dean Pera. 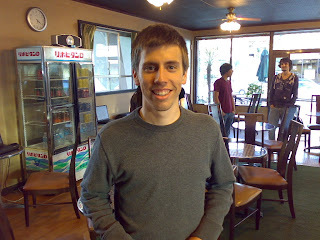 He is a second semester student coming to us via CCBC Murrieta. Zach knows him and told us that he was coming. He said that he is a great guy. He really is and we are blessed to have him with us this semester. Today we celebrated Iza's 20th Birthday. We were so blessed! Irma made Pizza, Philipino Spagetti and the fixin's. 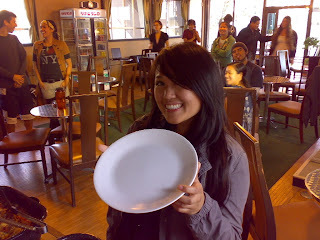 We all grubbed down. Hannah baked a delicious cake. The College students had a great time. Eder arrived via China Airlines. He had a little problem getting through customs, the reason: he came with a "one way" ticket. Eder is planning on staying here for at least one year to serve the Lord along side us here at the Bible College. Most of you remember Eder, he graduated from the Bible College last semester. It is great to have him back. Hello everyone! 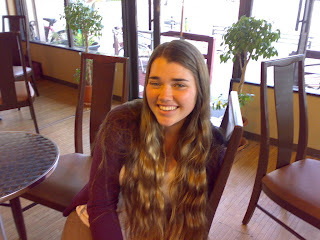 This is Kelsie Macklin from California and she comes to us via CCBC Murrieta. It is such a blessing to have her with us. She is a Second Semester Student. It was so funny this morning; she was on the computer when I came into the cafe and I thought that she was Tamiko from the back. When she turned around I was startled, she was a morning pleasant surprise. Please continue to pray for Kelsie and the rest of the students this semester, we are so blessed to have them all here with us. 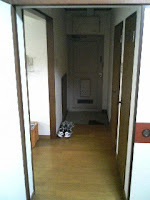 You only say "Sa-yo-na-re" (goodbye) when you will not see someone for a long time. 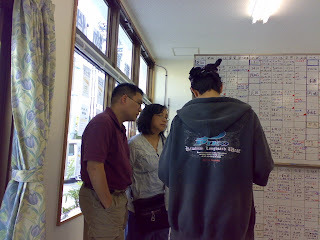 We will see both Sosi and Daniel in a couple of months when we take our missions trip back to Korea. 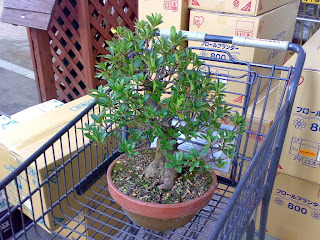 It is sad to say goodbye though, these guys have been with us for a long time here in Okinawa. 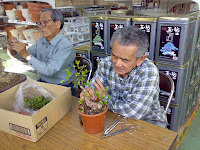 They do so much ministry, but they have done a good job to train others to take their place. We love you guys and are going to miss you, we do not say "sa-yo-na-re" but "ma-ta-ne (see you soon). 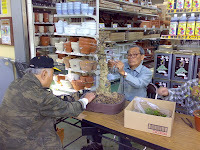 God bless you brothers, "your family in Okinawa". This is the last devotion for the winter break before the new semester begins next week. Ina led in worship while Pastor Tommy taught the Word. Also, this is the last devotion for Daniel and Sosimo, they leave for Korea that morning. Joel picked up the first group at the airport this evening right after church. It is a blessing that they arrived safely and look really good! The four that came are Megan Silva, Nate Blankenship, and Rusty and Amber Spearman. Praise God! We are so blessed that the Lord has brought them here. "Lord, do a good work in them, and thank you for their safe trip". In Jesus Name, Amen! Yesterday was Media Day for the Rangers Baseball Team. Rob said that it was real interesting. 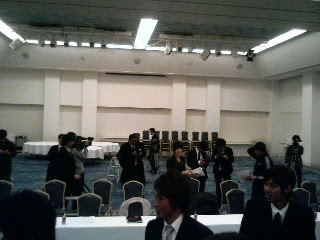 The Media introduced all the players and after they were done they began asking him questions. Rob was taken off guard but did his best. He looks pretty good in that suit huh? I think the guy next to him is his coach. Well, Rob said that he is fitting in good for his first few days, getting around town on his down time. 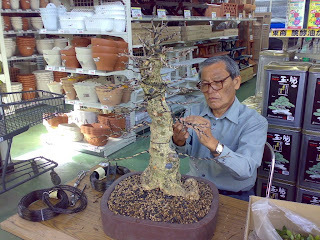 I was shopping at one of my favortie "Do it yourself" shops (Makeman) and they had these Professional Bonsai Dudes. They were shaping the trees right there. They looked awesome so I had to take some pictures. Don't the trees look beautiful? Vunder checked in with his new Baseball team and then they checked him into his new apartment. They told him that he would be rooming with two other guys, but they gave him his own apartment, a 3LDK apartment! You might be thinking what is a 3LDK? Well the LDK stands for "living room, dining room, and kitchen". So he has a 3 bedroom apartment all to himself! Wow! 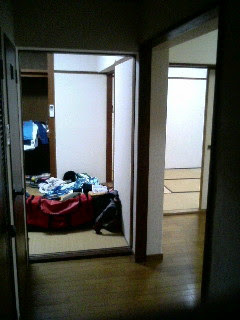 That is a big step up from living with 10 guys at the D House in Okinawa, to having all this living space. I am sure that Rob is going to miss having Daniel sleeping above him in the bunk bed. God bless you Rob, God has great things in store for you. God Bless You Rob and Josh! Rob and Josh left Okinawa today heading to Mainland Japan. Josh will begin life in the Tokyo area and Regina his wife and Claire his daughter will soon be meeting him there. 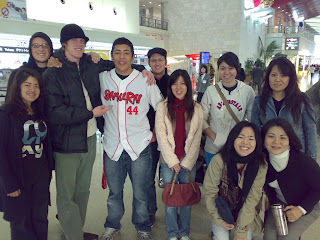 Rob on the other hand will be heading to the Osaka area and will begin Spring Training the next day. Both of these guys will be hitting the ground running. Most importantly, they need your prayers. Please lift both of these guys up before the Lord. God bless you guys, and we love both! It is a bummer for us but a blessing for them. 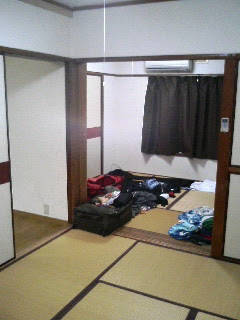 Rob, Sosimo, Daniel and Josh are all leaving Okinawa in the next few days. Rob is heading to Osaka to play Professional Baseball, Sosimo and Daniel are heading to minister in Korea, and Josh is going to Mainland Japan to continue serving the Lord in the Tokyo area. Each one of these guys are such a blessing to the ministry here at CCGinowan. May the Lord continue to lead, guide and bless these guys for His Glory. 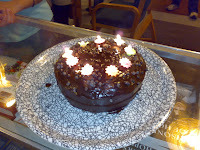 It's Naoko's Birthday and we celebrated after w2 Sunday night. She is always a blessing at the church and keeps the order at the Girl's D House along with Christina. We all know that Kayo gets out of hand and she needs that extra support, just kidding. Please leave a Birthday greeting below for Naokosan, and again, God bless you on your wonderful day. Rob's first autograph as a Professional Baseball Player. David asked him to sign a baseball for him during our Potluck after church Sunday. There is a first for everything, and David got the first autograph from Number 44, double death. God bless you Rob, may the Lord use you in a wonderful way for His Glory. Today we celebrated our Third Anniversary as a church at CCGinowan. After service, we had a big potluck lunch gathering. Like always there was too much food, and too much fun. Well, you can never have too much fun. Well, can you ever have too much food? Anyways, we were all blessed. "Thank you Lord for allowing us to continue for these three years, to serve the people here in Okinawa. Please grant us more blessing to reach out with Your love on the island. In Jesus Name we pray, Amen". Joely is back on Island! Praise God Joel is back with us again. 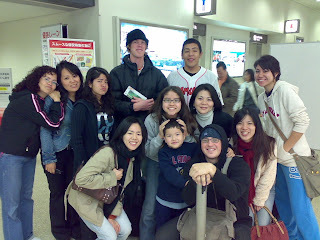 He headed home for the Christmas holiday but is now back in Okinawa. He had a blessed and safe trip from California, arriving in good spirits and a well rested body. Please continue to pray for Joel, God has great things in store for him. We were invited to attend the Video Men's Conference that was originally held in Anaheim California. Pastor Rick and Glenn had a vision to show it at their church. 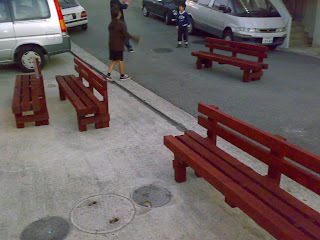 So some of the students headed out to CCOkinawa and were a part of the morning and early evening event. Thank you CCOkinawa for the gracious invitation. Well, Rob is leaving the island and it is time to say good bye to an old friend. We are talking about the Pink Limo. It has been slowly dying and Rob has been treating it like his own baby. It won't survive the new inspection that is due this year, so it is time to de-register it and send it to the scrap yard. It has been a great blessing. Thank you Shinobu for the blessing! It was a great car. 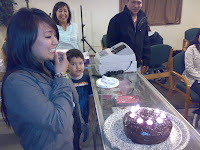 Today Tamiko turned 22, so we had a little celebration at our house for her. Can you believe it, she is double two's. Hannah make a cake for her from scratch, she even made the frosting (no can stuff for her). We spent the night watching "Chronicles of Narnia - Prince Caspian", it was a fun night. Please leave a birthday greeting for her below.